The ethos of King Edward's has always been to provide an education for the most able pupils from across the city of Birmingham, regardless of their background. Indeed this culture of support can be traced back to the founding of the Gild of the Holy Cross in 1392. The Gild was set up in order to improve and enrich the lives of the people of Birmingham. It also offered a social space in the city, the Gild Hall on New Street, and it was here, in 1552, that King Edward's School was established. 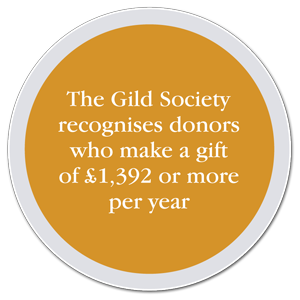 Taking inspiration from the school's origins in 1392, the new Gild Society has been established to recognise the generosity of donors who make an annual gift of £1,392 or more towards our fundraising efforts to support future generations of boys attending the school on Assisted Places. Your on-going support will allow the Trust to continue to build upon the foundations of the Gild of the Holy Cross, ensuring that an education at King Edward's remains open to any able boy across the city. Our initial aim is to recruit 100 members of the Gild Society. Together these members would be supporting at least 10 additional Assisted Places. Click here to find out how you can join the Gild Society.